The 1969 Boss 302 is and was, one of the most sought after Mustangs ever made. Combining the good looks of the 1969 Mustang fastback or sports roof as it was called then, the Boss was designed to look good, go fast and compete on the race tracks with the best of the best. Many argue that the overall package made a better car than it's big block brothers, including the Boss 429, having superior handling, lower weight and a higher revving engine. state of the art hot-rodding parts including an aluminum intake manifold, high compression pistons, a more radical camshaft and created a package that is still revered by Mustang enthusiasts. And any way you look at it, the "Boss" is an amazing car to this day. 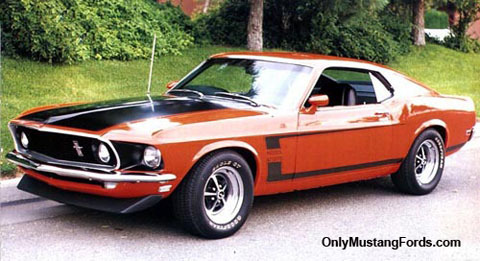 While the 1969 Boss 302 looked similar to other versions of the 1969 Mustang, it incorporated some visual differences from the optional sportsroof or fastback models and the Ford Mach 1 styling package. While the 1969 Mach l had simulated air scoops in the haunches just behind the doors, the Boss had smoothed sides. A special Boss logo, incorporated into a stripe package took the place of the Chrome "Mustang" logos on the sides of the car, letting you know instantly, that you were seeing a genuine Ford Boss 302 Mustang and not just some pretender, that was no more than a grocery getter. 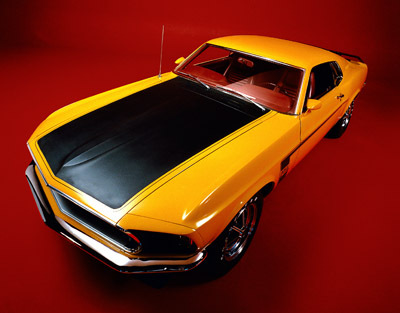 The 1969 Boss 302 Mustang also had it's own special black hood treatment and depending on which assembly plant it was built, it may have it's trunk lid in black as well. The rear tail light panel was also painted black. Let there be Spoilers ! 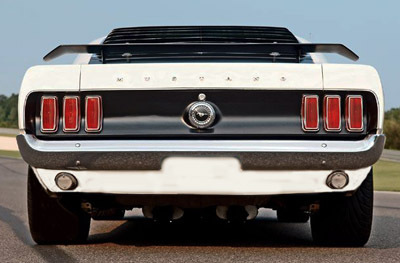 At the front and rear aerodynamics and lift were controlled by a front chin spoiler and a wing at the rear of the 1969 Boss 302 Mustang. While the front air dam directed front airflow around the car, it also provided additional downforce for better handling. 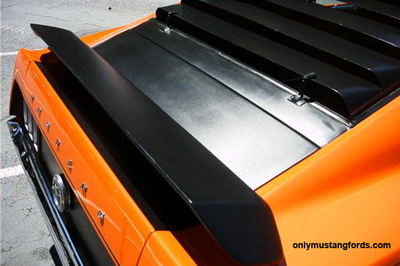 The adjustable rear spoiler was functional as well, and the aerodynamic package was as a result of Designer Larry Shinoda's work on managing the air on a race car. The added downforce on the rear wheels enabled the car to stay firmly planted on the ground and was fully functional at considerably lower speeds than others, such as the huge wing on the Roadrunner Superbird. The big Plymouth's wing provided almost no downforce until the car reached speeds in excess of 100 mph. And if you were so inclined,you could order the purely aesthetic and pretty cool, optional rear window slats. The interior of the Boss was pretty standard 1969 Mustang fastback (sportsroof). The interior was available in both, the standard and deluxe versions. The major difference to the eye would be that all Boss Mustangs were of the 4 speed standard variety. Like other 1969 variants, in the place of the right instrument pod's accessory "gauges" was the availability of an optional tachometer. The 1969 Boss 302 V8 was not quite like the other Mustang 302 V8 offerings. The engine was composed of a high nickel alloy block with screw in freeze plugs and 351 style heads, which provided for larger valves and necessitated the altering of some of the water passages. This specially prepared 302 cubic inch Ford V8, was primarily designed for high rpm power and was built to become a strong performer in the racing circuit. This engine was conservatively rated at 290 horsepower at 4,600 rpm, yet it was said to actually output some additional 50 horses or even higher and was easily capable of producing even more, once the restrictive carburetor and exhaust system was changed for all out performance. 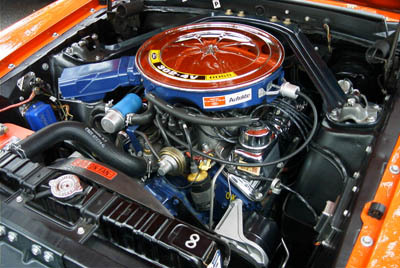 Like a hot rod, and it's nemesis, the Z28 Camaro, this engine sported solid lifters, a high flowing performance aluminum intake manifold and a more aggressive camshaft profile. Race versions of the 302 cubic inch V8 pumped out over 450 horsepower and ran upwards of 8,000 rpm in competition trim. While many people associate the famous "shaker scoop" with the Boss and it was an option in 1969, the cowl induction set up was actually available only for the 351 W, 390 V8 and 428 Cobra Jet. 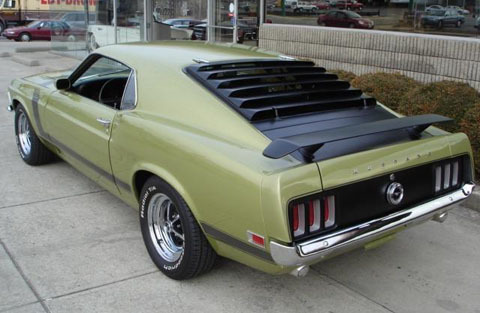 It finally became available on the Boss 302 for the 1970 model year. With a limited production of only 1,628 cars, only about 400 more than the limited production and famous 429's, the Boss has become a highly prized and expensive classic car. The steering gear was a responsive 16:1 ratio and the suspension was tuned for racing, with special staggered rear shock to minimize twisting under acceleration and improve handling. 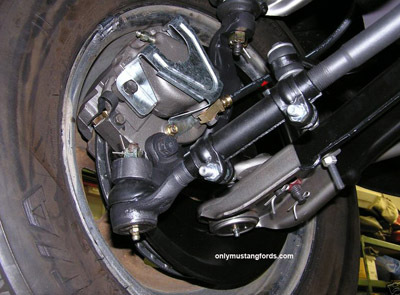 The car sported 11.3 inch disc brakes at the front, heavy sway bars and race proven shocks. The limited production was for a reason. In order for the car and it's specially designed engine to qualify for racing homologation as a "stock" production engine, a minimum of 1,000 units had to be sold. The car's success on it's own as well as its outstanding results on the race circuit were probably the reason that some 600 additional cars were built. In fact, at a recent Barret Jackson auction (spring 2012) a nicely equipped Boss sold for $97,000. Amazing, considering the recession has caused prices of classics and special interest automobiles to drop over the past several years. Important cars, stay important over the years. And the fact that the legend was recreated for the 2011 model year says it all.